Day 1 of our induction process included taking a pill (mifepristone) that would basically stop the pregnancy from continuing. My understanding is that it stops the pregnancy hormones and essentially primes your body for the second step of actually inducing to give birth. I took this pill on Monday 8/7/17. On day 2 of our induction process, I went to the hospital to be induced (8/8/17). Our induction was supposed to happen at 11:00am. Instead, due to the labor and delivery department being busy, we were pushed out. It was a looooong day of just waiting around at the hospital. Our induction was started at around 6pm. This part of the process involved a vaginal insert (misoprostol) that would cause my uterus to contract and allow me to deliver April Rey. They put about 4 or 5 pills into my cervix. This was definitely an uncomfortable process. I also, of course, was hooked up to an IV for fluids. In addition to this, because of my antiphospholipid syndrome that I’ve had to continue doing injections for, they also injected me with heparin to prevent any blood clots. The doctors explained to us that this would be a long slow process. Their plan was to check me every 3 hours and see if I was dilating. They’d continue the misoprostol inserts every 3 hours as well. I was instructed to stay flat in bed so the inserts would not fall out. I’m not exactly sure when the pain started, but it seemed to happen pretty quickly. The contractions were very intense (worse than anything that I remember with my first pregnancy). I had originally been told that I wouldn’t be able to have an epidural until around midnight (due to the heparin injection I’d been given), and I was wondering how on earth I was going to make it that long. My entire body was shaking from the intensity of the pain, coupled with a bad fever that was caused by the misoprostol. I could not relax or get the contractions under control. At this point I was really looking forward to my epidural and having a hard time breathing through the pain. I was refusing any other type of pain medication, because I did not want to be drowsy, and I did not want any chance of April Rey being impacted by pain meds, either. I remember the moment very clearly, however, when our nurse came back in to tell us the good news- I could have my epidural at any time. We gave them the go ahead to call anesthesia. It all gets a bit blurry, but I remember that I sat up (I think it was 2 hours after the misprostol had been inserted around 8pm). The contractions immediately loosened and the pain was much better just from the simple act of being able to sit up. I still had horrible shakes from the fever, but we were able to get the epidural done. Soon after, my left leg was completely dead with no feeling. I was so disappointed because I’d asked for barely any medicine through the epidural, and specifically that I wanted to feel my legs. The right side of my body was completely unaffected by the epidural and I was feeling everything. The contractions were very intense on the right side. At 9 pm, the doctor came back in to check me. I was 1 cm dilated. Everyone basically agreed that it would most likely not be until the following day that I was going to give birth. We even told our photographer to settle in for the night. They inserted several more of the misoprostol inserts. The anesthesiologist kept coming to check on me. Since I had one dead leg, and one side that was still in full pain mode, they had me lay on the right side to help guide the medication that direction. They also pulled the epidural further out a few times to help even things out. Unfortunately, I think all that happened was that it stopped working on both sides. The anesthesiologist poked me a few times with a sharp tool. The left and right sides of my belly, and all up and down my right leg all felt the same “poke” that my arm did. I wasn’t getting the medicine to those areas. The only area seemingly still impacted by the epidural was my left knee. The pain of contractions again started to worsen and get hard to take. I did not have a catheter in yet, but I could not walk due to no feeling in my left knee. I had to call the nurse in a few times to use the bed pan. Not the most glamorous moments having to pee in front of everyone. I had no idea what was to come however. Suddenly, quite suddenly, I had to do a bit more than pee. I was now going to have to poop in a bed pan, and I had no choice. It was around 11:00 pm that I had to call the nurse in quite urgently. I, of course, had my husband leave the room so I would not be completely embarrassed (there are some things better kept private)! I was done using the bed pan, except I wasn’t. Suddenly the pain was excruciating. I was screaming for help, and the pain was unreal. I was insanely hot, and I was throwing things off of the bed. The pillows, the sheets, and even my gown were all too hot to be near me. I threw everything to the floor so I could try to deal with the pain. Clearly my epidural was not helping much. I felt immense pressure, and then it happened- my water broke (a huge surge all over the floor). Before I realized what was happening, I saw April lying on the table in front of me. I’d pushed her out and she was born (11:22pm). There was soooo much going on. I don’t even know who all was in the room at this point, but I knew my husband was still in the hallway thinking I was simply pooping. My screams for help, suddenly turned to screams for someone to find my husband. Then we saw her move. I think this was all a matter of seconds, really. I hadn’t even had a chance to reach down for my daughter. She was alive! They grabbed April and examined her ever so briefly before placing her in my husband’s hands. They listened to her and confirmed that she was breathing and her heart was beating. Our April Rey was alive! She was put into my hands. I was so thankful to have my hospital gown off. I held her against my skin and felt every part of her. I put my finger into her tiny hand, and she squeezed. She was snuggled up into Mama and holding my hand. I will always remember this moment. My husband was in tears looking at his baby girl that he knew would soon die. I felt an odd calmness come over me. I didn’t shed a tear while I held her. I was happy, so happy to meet April Rey. She seemed to fill me with strength in that moment, and I just enjoyed her. We aren’t sure exactly how long she was alive, but after a few minutes we asked for them to check again. They said she’d passed (11:33 pm). 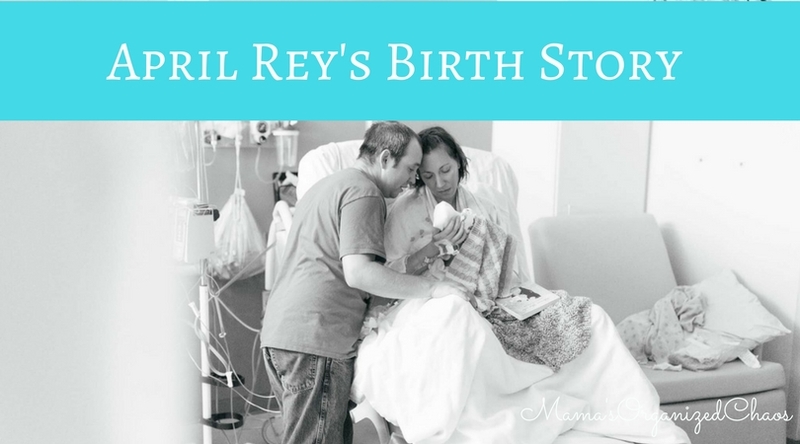 April Rey was held and felt nothing but love for the entirety of her unbearably short life. She had a look of contentment on her face that never changed. She was never in pain. This is exactly what we wanted for her, and exactly why we’d chosen to do the induction when we did. She was peaceful and happy in Mama’s arms and knew nothing but love. At some point the photographer arrived, my parents arrived, and our daughter (Caroline) arrived with my husband’s parents. Everyone had a chance to hold her and say their hellos and goodbyes. Caroline had expressed that she’d wanted to hold April, but when it came time, she was too overwhelmed by everything going on. She was even nervous to be near me, and unfortunately I was stuck in the hospital bed, still sporting my dead knee. She did get to be there, however and meet her baby sister. Caroline had the idea to bring a book, and I am so glad that she did. I’d picked out “Wherever You Are: My Love Will Find You” by Nancy Tillman. I read the book out loud to April Rey, and while she wasn’t alive while I read, she still got a story time with Mama and Daddy. The precious words of this book have a much new meaning to us now and it turned out to be the perfect message for April Rey. Our time with April Rey was amazing. Everything about her was absolutely perfect- her fingers, her toes, her nose, her slight smile. 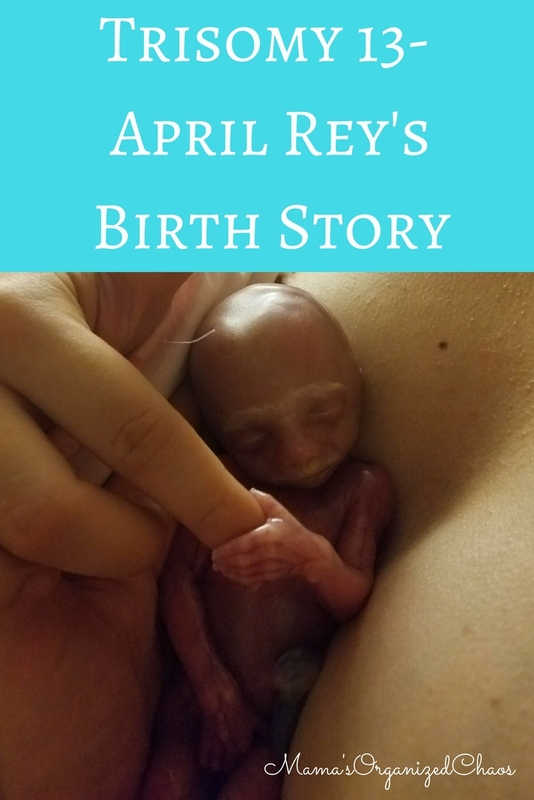 She was a fighter and clearly wanted to come out when she was ready (I can’t imagine that in two hours from 9 pm to 11:22 pm that I’d dilated much more than 1 cm… but April had her own plans). She pushed her way out, and she stayed alive to have time with Mama and Daddy. Our moments were fleeting, but they were perfect.